1. Post Graduate degree in concerned AYUSH System from a recognized University in India. 2. 15 years standing in profession of which 2 years as Professor (pay band-4, grade pay not less than Rs. 8700/-) or in equivalent grade in Research/Administration/ Clinical. OR 15 years standing in profession of which 5 years’ as Associate Professor/Reader (pay band-4/3, grade pay of not less than Rs. 7600/-) or in equivalent grade in Research/ Administration/ Clinical. 3. At least 10 Quality Research work published in reputed peer reviewed research journals. 1. 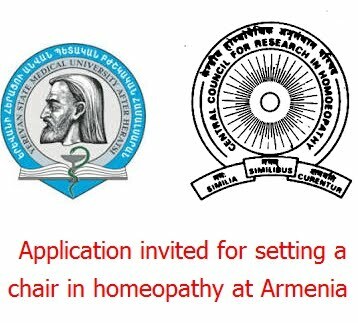 Candidate possessing PhD in concerned AYUSH System will be given preference. 3. Experience of involvement in policy matters for academic/ research issues at national level. 4. Working knowledge of English, Urdu/ Arabic/ Persian (in case of Unani),Sanskrit (in case of Ayurveda & Yoga), Tamil (in case of Siddha). 5. Working knowledge of Computers. 6. For clinical experience, it should be in Central/ State Government runhospitals/ dispensaries. 7. Age: Not to exceed 65 years, as on the date, the tenure of the officer to the Chair ends. 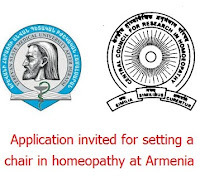 Application should reach Director General, Central Council for Research in Homoeopathy(CCRH) within 30 days of the publication of advertisement in Employment News . Address: Jawahar Lal Neheu Bhartiya Chikitsa Avum Homoeopathy Anusandhan Bhavan No. 61-65, Institutional Area Opp D Block, Janakpuri New Delhi. 110058 Only eligible candidates will be called for interview. Second class AC fare will be reimbursed.